Immerse yourself in complex polyrhythms and it doesn’t take long before melodic patterns immerge. And if you’re lucky enough to experience said immersion where the music originates, other sounds appear to be directly connected with the music. Whining, fiddle-like cicada buzzes, a goat eating grass, or someone crafting fishing nets all begin to sound naturally connected to local drumming. And in the Republic of Congo, where the founder members of Les Tambours call home, there are some 50 ethnic groups whose approach to drumming takes on at least as many rhythmic hues, all likely as influenced by landscape as by connections to neighboring tribes. Les Tambours have the complex job of representing a cross section of Congolese rhythms as well as figuring out ways to entertain increasingly global audiences as an ensemble with a focus on drums. Since their 1991 formation, they’ve amped up the spectacle, playing shirtless in an effort to show masculinity in its most seemingly unstained, fibrous state. They’ve incorporated precision dance moves and deployed all manner of vocalists, bassists, guitarists, and trap kit players to offset what might get same-y for listeners who don’t understand that every aspect of musical sound can exist in the hands of ensembles containing nothing more than a variety of expert, creative percussionists. Musically, Les Tambours have explored Central Africa soukous, Taraab from Zanzibar, and their own take on rap. And because all of the spectacle, as well as the stylistic gumbo in which they dabble, they are in no way representational of Brazzaville specifically, or Republic of Congo in general, not that they are even trying to deal in perimeters so narrow. 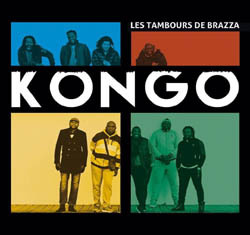 Les Tambours are a pop band, something made increasingly clear on Kongo. From the growling vocal showcase and repeated guitar figure driving “Bakwaku Wo,” to the sinewy South African Zulu-influenced harmony vocals (“Brazza”) or the almost Sanatana-esque six-string licks of “Ah Me Bunsana,” this is a polished, produced ensemble with an army of Ngoma players underpinning whatever direction a particular track calls for.